◎ The “subdued” media coverage of Xi’s southern tour and his other gestures in Guangdong is closely connected to the CCP factional struggle. Xi Jinping went on an inspection tour in Guangdong from Oct. 22 to Oct. 25. At each stop, he signaled strongly that China should continue to reform and open up. On the last day of his trip, Xi visited the Southern Theater Command headquarters in Guangzhou. Observers have noted that mainland media was oddly quiet about Xi’s “southern tour.” State media also omitted mention of Deng Xiaoping and his “reform and opening up” in its coverage of Xi in Guangdong. We believe that the “subdued” media coverage of Xi’s southern tour and his other gestures in Guangdong is closely connected to the factional struggle in the Chinese Communist Party and intensifying external pressures. 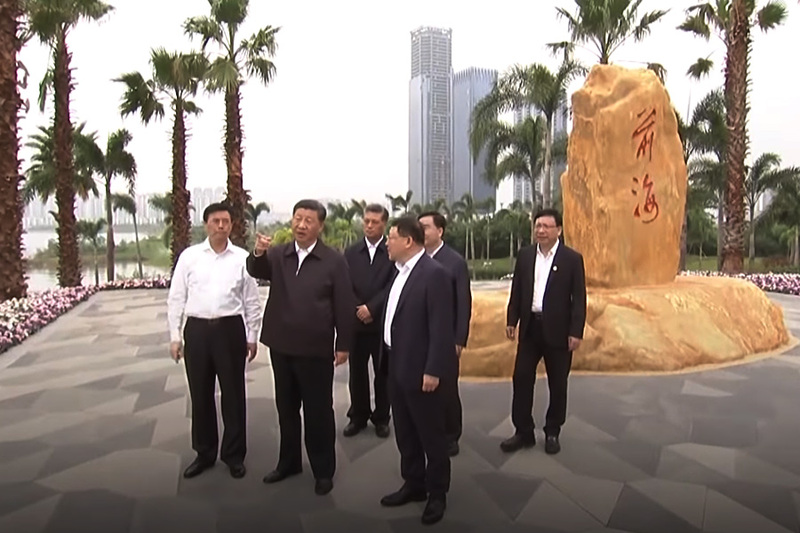 Oct. 22 – Xi Jinping begins his Guangdong trip in Zhuhai City. When inspecting Gree Electric, he stressed that self-reliance, independent innovation, and the mastering of critical technologies should be at the core of China’s manufacturing industry. Oct. 23 – At the opening ceremony of the world’s longest bridge connecting the mainland to Hong Kong and Macau, Xi said, “I announce the Hong Kong-Zhuhai-Macau bridge is officially open.” The brevity of Xi’s speech surprised overseas reporters covering the event. Xi Jinping traveled to Guangdong during troubled times for his leadership. The Sino-U.S. trade war has severely impacted China’s worsening economy and the markets are in a panic. The Trump administration will also no longer negotiate with China unless it comes up with a concrete proposal to address Washington’s trade and intellectual property theft complaints, according to the Wall Street Journal. The China-U.S. standoff may undermine a planned meeting between President Donald Trump and Xi Jinping at the G20 meeting in November. Meanwhile, America’s allies and other countries have started calling out the People’s Republic of China for its abusive trade practices, spying, influence campaigns, political interference, and human rights abuses. Xi’s “subdued” southern tour is a result of intense external and internal pressures facing the CCP regime. In analyzing the quiet media coverage to statements about reform direction, Xi appeared to be treading a fine line between avoiding further antagonizing the U.S. on trade while restamping his authority in the Party. 1. The timing and context of Xi’s inspection of the Southern Theater Command headquarters suggest that he is attempting to reassert his authority over the military in particular and the Party in general. While some media seem to suggest in their headline that Xi is making a call to arms, it is in fact usual for Xi to stress military preparedness whenever he inspects the troops. 2. There are three possible reasons why state media did not mention Deng Xiaoping or his reform effort. First, Xi Jinping needs to exude paramount authority to quell internal opposition. Bringing up Deng in media reports of Xi’s southern tour allows for comparisons to be drawn between the two, and comparisons naturally undercut Xi’s brittle authority. Second, Xi likely considers himself to rank ahead of Deng in the pantheon of leaders after the inclusion of “Xi Jinping Thought” to the Party constitution. And if Xi wants to signal that he is above Deng, it makes little sense to call attention to the achievements of the latter and undermine his own authority. Third, Xi is likely signaling to the Party that his reforms will be more comprehensive than Deng’s economic reforms. Indeed, if Xi is to produce a list of concrete reform proposals for Washington, he needs to push through tough political reform to ensure that economic reform works. 3. Xi Jinping’s Guangdong trip was only covered by Xinhua and other Party or state media. Local semi-official newspapers merely republished content from official sources and produced no original reporting or commentary, unlike during Xi’s last official tour of the region in 2012. The factional struggle and Sino-U.S. tensions can explain the tight control over propaganda produced about Xi’s southern trip. First, if left to their own devices, the nationalistic and more left-leaning publications like the Global Times are bound out of habit to produce extravagant flattery or write overly boastful commentaries. Such propaganda would be counterproductive to the “knuckle down to reform” messaging that Xi seems to be projecting domestically. Inflammatory rhetoric also risks provoking more retaliatory sanctions from the United States. Second, mainland media always mention Deng Xiaoping whenever the topic of reform and opening up is broached. As seen in point 1, Xi has political reasons for not wanting to remind people of his predecessor. Thus, it would make sense for only the main Party and state media to report on the Guangdong trip so that the Xi leadership can tightly control the messaging. Third, the Xi leadership probably feels that it does not control the propaganda apparatus enough to permit media outside Xinhua, People’s Daily, and China Daily to cover the southern tour to Xi’s specifications. The Jiang Zemin faction has long controlled the CCP propaganda apparatus, and it was only during the 19th Party Congress that two senior officials (Wang Huning and Huang Kunming) who seem to have Xi Jinping’s trust replaced Jiang faction officials (Liu Yunshan and Liu Qibao) as head of the Propaganda Department and propaganda apparatus. In American political parlance, the Xi leadership has yet to overcome its “deep state” problem. 4. Xi’s southern tour is also likely an attempt to resolve the mixed signals about “guo jin min tui” (“the state advances, the private sector retreats”) that cropped up shortly after the 19th Congress. In January 2018, a professor at Renmin University first raised the idea that the CCP should do away completely with the private sector in the Party’s Qiushi Magazine. The notion that the CCP government would abolish private enterprise gained traction in early September after a former government investment banker raised it in a widely read essay. The “guo jin min tui” debate caused investors, enterprises, and the markets to panic, and market confidence took a hit. The Xi leadership sought to soothe private enterprises and restore market confidence starting in late September. During his tour of the northeastern region, Xi Jinping talked about being “unwavering” in developing and protecting the private sector. In an interview with state media on Oct. 19, vice premier Liu He said that local officials and financial institutions would run into “huge political problems” if they do not support the private sector. On Oct. 22, the first day of Xi’s southern tour, premier Li Keqiang announced that the government would provide more support for private firms in raising funds in capital markets. Xinhua commentaries on the Guangdong trip also reiterated the importance of the private sector and strongly signaled Xi’s intention to reform. The recent outpouring of endorsement of the private sector by the Xi camp means that it is unlikely that the Xi leadership was perhaps floating a “trial balloon” with the controversial idea of doing away entirely with private enterprise. Two likelier reasons are interference by the Jiang faction to undermine Xi or local officials eagerly promoting left-leaning policies to secure promotion after mistaking Xi’s power consolidation for a hard left swing in CCP politics. Be it confused “better left than right” officials or political opposition, Xi’s southern tour is clearly designed to send an unambiguous message to the Party that he is not doing away with private enterprise and is determined to enact economic and political reform. Xi is also almost certainly signaling to the Trump administration that he is serious about making a concrete proposal to address U.S. complaints. 5. It should be noted that the notion of “guo jin min tui” did not originate under Xi Jinping, but rather during the 1990s when Jiang Zemin essentially negated then-premier Zhu Rongji’s efforts to privatize the state sector. At the time, the Jiang clan and faction snapped up many of the newly privatized state enterprises, and ended up key segments of China’s economy. A popular joke during the Jiang era involves a man being impressed that his friend pays fees to Jiang Zemin and Zhou Yongkang (which seems to indicate that the friend is well-connected) only to discover that his friend was talking about paying his phone and petrol bills (Zhou once headed China National Petroleum Corporation, while Jiang’s elder son Jiang Mianheng is known as the unofficial controller of a state telecommunications empire). When Xi took office, he focused on cleaning out corruption and the Jiang faction influence in the state sector. Yet Xi does not have many options aside from mixed ownership reform. Privileging and supporting state-owned enterprises is a priority for maintaining the Party’s authority, but SOEs are notorious for being corrupt, low-productivity ventures that lack innovation. Ironically, overly prioritizing SOEs ends up threatening the survival of the regime. On the flipside, private enterprises are more innovative and have greater vitality, but risk posing an existential threat to the regime once they become too big, or are backed by significant foreign investment. There is also a risk that very successful private firms end up leaving China to avoid having to become SOE life-support units. Hence, the CCP has ruled that large private corporations must set up Party committees in what is almost certainly a move to rein in the private sector. All in all, the “guo jin min tui” and mixed ownership reform issues expose the limitations of CCP dictators and the inherent contradictions of the communist system. On the one hand, the only way that Xi Jinping could consolidate power to a high degree—a necessary move to overcome political rivals who were blocking his reform policies—was through the “Maoist” route. On the other hand, going the “Maoist” route shackles Xi’s fate with the communist regime and makes it immensely difficult for him to push through liberal reform. Xi Jinping very likely inspected Guangdong to send a crystal clear message to the Party and America that he is set on reform and opening up China, and is not planning to close up the regime. That Xi had to tightly control propaganda about the southern tour suggests two things, 1) the CCP factional struggle is in a critical phase, and 2) Xi does not wish to provoke an escalation of the trade war with the United States. Expect Xi and his allies to continue signaling reform in the lead up to the Fourth Plenum.